The retailer has been a victim of the retail apocalypse, closing 147 stores in 2017. “The disruption that has characterised the retail industry recently is not going away,” Foot Locker CEO Richard Johnson said Friday. “We continue to prune the fleet of under-productive stores and open a few select, high-profile stores,” CFO Lauren Peters said in a call with investors on Friday. Foot Locker closed 147 stores globally in 2017. The retailer also opened 94 new locations, bringing the retailer’s store count to 3,310 around the world. Johnson said that Foot Locker was working to reduce its exposure to “deteriorating” malls, as the retailer worked to rebuild its business and win back customers. Foot Locker has struggled in recent years. As mall traffic has declined, Foot Locker and other mall-centric brands have struggled to keep locations open, especially as anchors like Sears and Macy’s have shuttered locations. At the same time, e-commerce traffic has exploded, allowing customers to buy brands like Nike directly from the company or from online competitors such as Amazon. 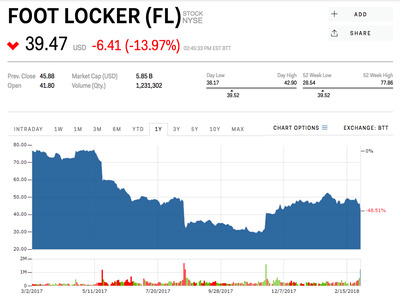 In August 2017, UBS analyst Michael Binetti downgraded Foot Locker, saying it is “almost certain” that the sneaker retailer will lose market share to Amazon. On Friday, the company reported a net loss of $US49 million, or 40 cents per share, in the fourth quarter. Shares of the company’s stock dropped more than 13% following earnings on Friday morning.